I have dedicated my life to the study of the deadly arts. I can blend in with any crowd, strike from any direction, and eliminate anyone with a single thrust of my blade. 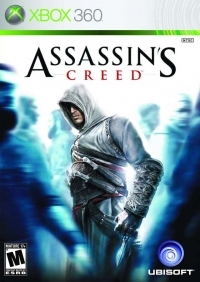 My name is Altair and my actions will be remembered for ages to come. • Plan your attack, strike without mercy, and fight your way to escape. • Open-world gameplay lets you decide how and when to achieve objectives. • Crowds react to your every move and will either help or hinder you. 02-12-2019 silverbow Box Text Master the Art of the Kill I have dedicated my life to the study of the deadly arts. I can blend in with any crowd, strike from any direction, and eliminate anyone with a single thrust of my blade. My name is Altair and my actions will be remembered for ages to come. • Plan your attack, strike without mercy, and fight your way to escape. 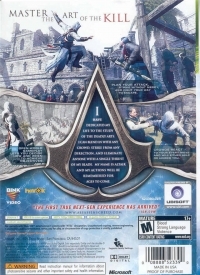 • Open-world gameplay lets you decide how and when to achieve objectives. • Crowds react to your every move and will either help or hinder you. 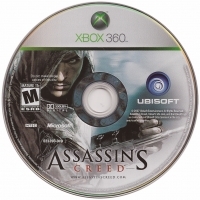 This is a list of VGCollect users who have Assassin's Creed in their Collection. This is a list of VGCollect users who have Assassin's Creed in their Sell List. This is a list of VGCollect users who have Assassin's Creed in their Wish List.